Consumer’s appetite to watch their favorite shows anytime anywhere is showing no sign of slowing. And the ever increasing availability of IP connected devices is fueling this demand. No wonder, pay-TV operators are looking to offer OTT services to meet this growing need. Yet, availability of internet bandwidth is a limiting factor for many. In my experience, the minimum bandwidth needed for online video is 500kps for SD and 1500 kps for HD. For a lot of operators overcoming this limitation is a real problem. The latest generation video compression standard – high efficiency video coding (HEVC) promises the same quality as today’s advanced video coding (AVC) at twice the compression capabilities. HEVC is usually associated with 4K but it also offers substantial benefits for SD/HD. Once operators have STBs which handle the HEVC codec, this allows them to be able to distribute the same quality video using half the bandwidth currently needed for an MPEG-4 video. Essentially this means more room for more channels or other revenue generating services over their existing network. As Richard Scott, Irdeto SVP Sales & Marketing, highlights in his blog it allows operators, particularly satellite operators, to benefit immediately from bandwidth savings. And the benefits don’t stop there. Because there is less data due to compression HEVC also reduces the per-megabyte cost of delivering video to the consumer. The improved quality means that OTT content will be as good as broadcast quality. 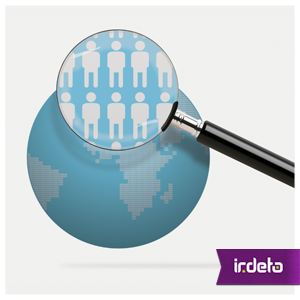 But what about reaching larger audiences; growing the OTT footprint for an operator? By plotting the actual internet speed and the numbers of users per speed, we are able to forecast how many more people would be able to watch online video if HEVC was in use. 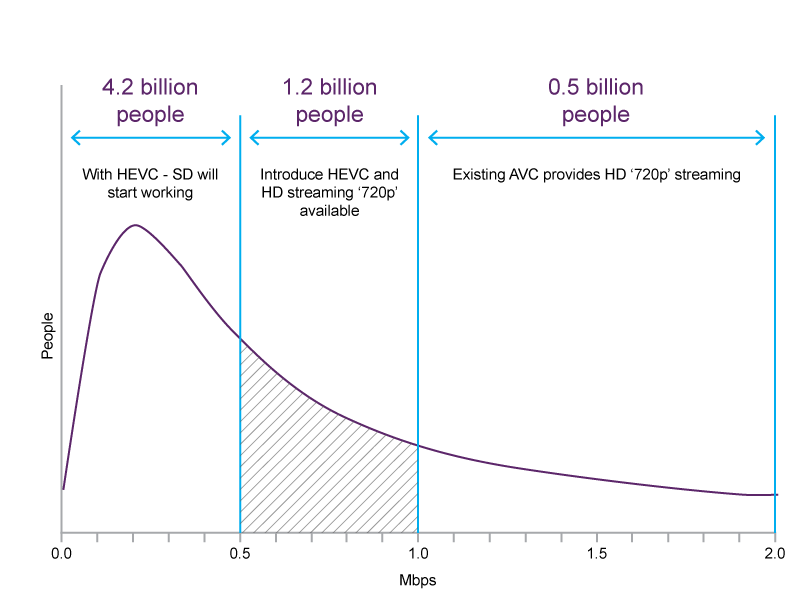 As you can see in the graph below, deploy HEVC and overnight there are 1.2 billion extra people who are now able to watch HD online video! Embrace the technology: HEVC and MPEG-DASH. More on DASH in another blog. Make it easy to use. In addition to a personalized user experience, as HEVC enables you to offer more channels having a comprehensive content discovery solution is essential to help consumers find what they are looking for. Offer flexible business models. Being able to support different payment options be it SVOD, TVOD, PPV, Ad-based, etc. in a simple convenient way allows you to monetize your content quickly. There is a huge opportunity with the addressable market doubling as this technology change rolls out over the next couple of years. This entry was posted in Media & Entertainment and tagged DASH, HD, HEVC, Irdeto, OTT, STB. Bookmark the permalink.